Jennifer L. Holm, Author: Lacey Loves to Read! 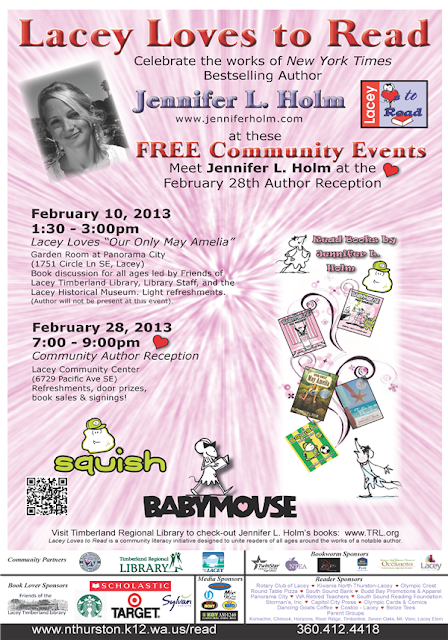 Throughout the month of February, the community is invited to read works by award winning author Jennifer L. Holm, and attend a special “Meet the Author” reception at the Lacey Community Center on Thursday, February 28, from 7:00 to 9:00 p.m. The evening includes refreshments, great door prizes, and a book signing with the author. For more information, check out this link and hope to see you there!